Get ready to continue the Japanese Defense Force's battle against otherworldly monsters with Crunchyroll's winter 2016 simulcast of GATE season 2. The action picks up right where season 1 left off and will broadcast every Friday starting January 8 at 10:30am Pacific Time. 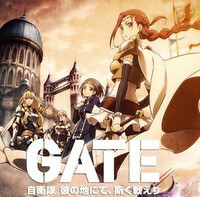 GATE season 2 will be available to Crunchyroll members in the following territories: USA, Canada, Australia, New Zealand, South Africa, Latin America, Europe (excluding French and French-speaking territories), the Middle East, and North Africa. From the studio that animated Sword Art Online and Anohana: The Flower We Saw That Day, A-1 Pictures will once again be animating GATE. Voice actor Junichi Suwabe, known for roles such as Archer from Fate/stay night: Unlimited Blade Works and Daiki Aomine from Kuroko's Basketball is back as the otaku soldier Yoji Itami, along with Hisako Kanemoto, voice of Sailor Mercury in Sailor Moon Crystal, as Tuka Luna Marceau. 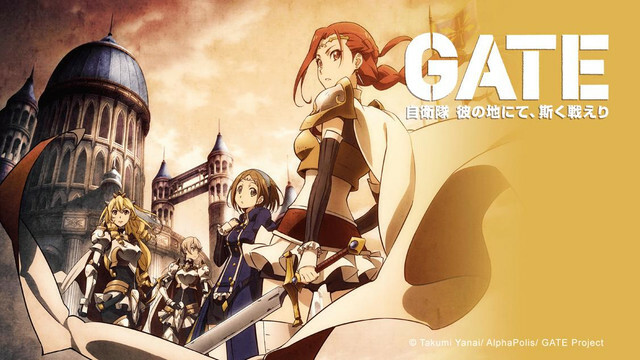 The opening will be "GATE II ~Sekai wo Koete" by Kishida Kyōdan & the Akeboshi Rockets, while voice actresses Hisako Kanemoto, Nao Tōyama, and Risa Taneda will perform the ending theme once again.